Gap Filler completed its first temporary architecture BUILD project. Oh my! The Pallet Pavilion was a transitional architecture project that functioned as a community space and venue for events. It was built by volunteer power over 6 weeks in late 2012. 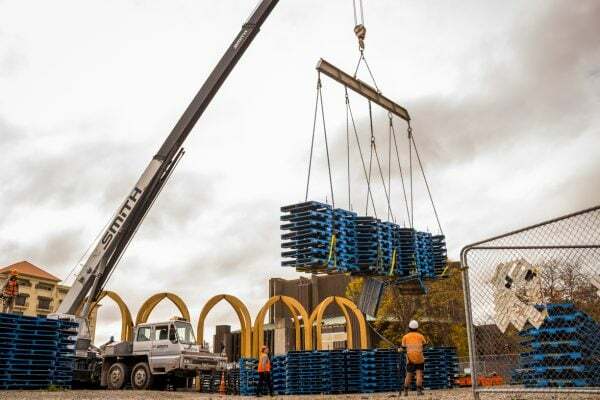 Gap Filler harnessed the goodwill and desire of Christchurch residents and businesses to construct a new temporary events venue for the city. 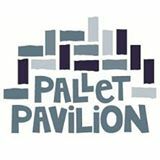 A visually engaging and dynamic space, the Summer Pallet Pavilion was built from over 3000 wooden blue CHEP pallets and was a showcase for the possibilities of innovative transitional architecture in a city that is ready to embrace new ideas. Designed by emerging designers, supported by established professionals, and built from loaned, reused and donated materials using volunteer, professional and community labour, it was a testament to the effectiveness of a collaborative and community-minded process. That creative ethos continued through its use, as the Pavilion hosted live music, outdoor cinema and a wide range of other events from Thursday to Sunday and was also available for hire by any individual or community organisation at other times. Luis Castillo, Mark Willard, David Elliot, Ros So-Beer and Paul Martini – Aurecon. 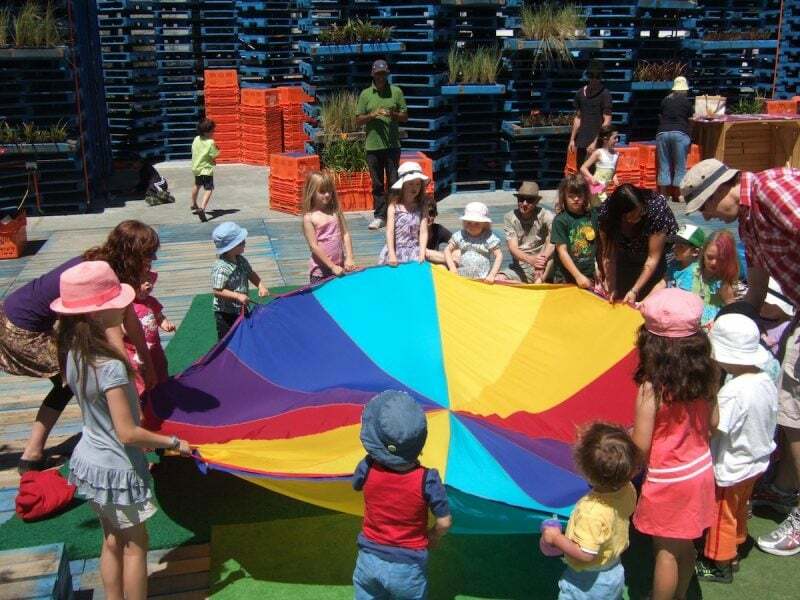 Over the summer, the Pallet Pavilion helped to address the city’s need for new small-to-medium sized venues, after the loss of clubrooms and community halls demolished as a result of the earthquakes. Located on the prominent site of the former Crowne Plaza Hotel, at the head of Victoria Square, the Pavilion also aimed to draw people back into Christchurch city, supporting central businesses and promoting the central city as a place for experimentation. It was a family-friendly venue and something uniquely designed for Christchurch! The Pavilion opened in early December 2012. The blue exterior conceals a secret garden, with landscaping creatively integrated into the walls and stepped seating. The selection of plants will bloom over the course of the summer. With a capacity of 200 people, the pavilion will be open daily as a public space and host organised events most evenings. It will be equipped with a basic sound system, a small triangular stage and a video projector and screen. Thursday to Saturday in the Summer the Pavilion will be used largely as a venue for live music in a city that has lost many live music venues. For the rest of the week it will be available to the community for a small hire fee. A limited number of paying corporate events will contribute to the Pavilion’s ongoing running costs. The general day-to-day programming and running of the venue is done by local father and daughter duo, Amy and Glen Jansen. The desire is to create an intriguing and welcoming space for people to visit, spend time and use. 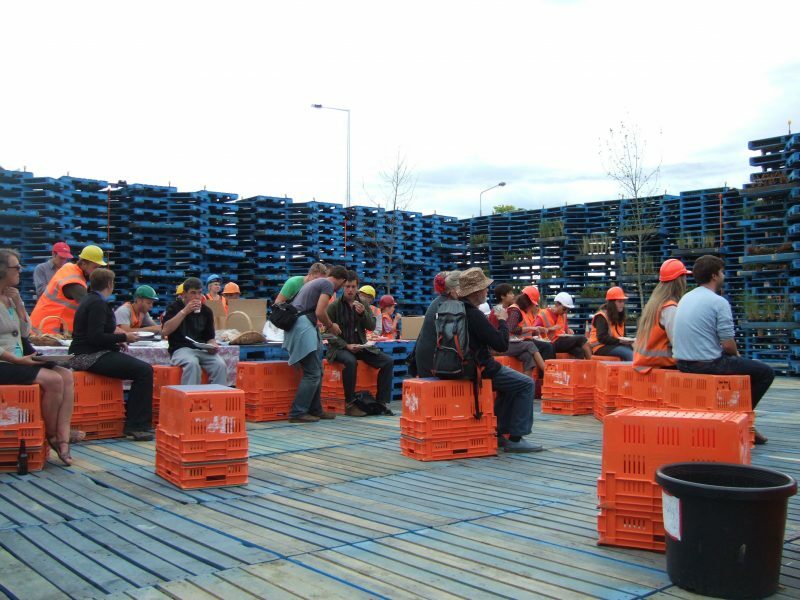 Volunteer participation had been key to the Pallet Pavilion from start to finish. It was woven into the project’s DNA. The vision for the pavilion was to build a piece of temporary architecture from a modular item with the help of volunteers. This constraint impacted upon the design as it had to allow for unskilled people to put it together and as such had to be simple and safe. The Pavilion was then to live as a community venue, run with the help of volunteers before it was then dismantled. This would be done by volunteers once again, with the composite elements of the Pavilion returning to where they came (pallets fruit crates, some plants) or going on to new uses. In this way, volunteers and community participation were part of the project at each and every stage and made for a highly successful project. 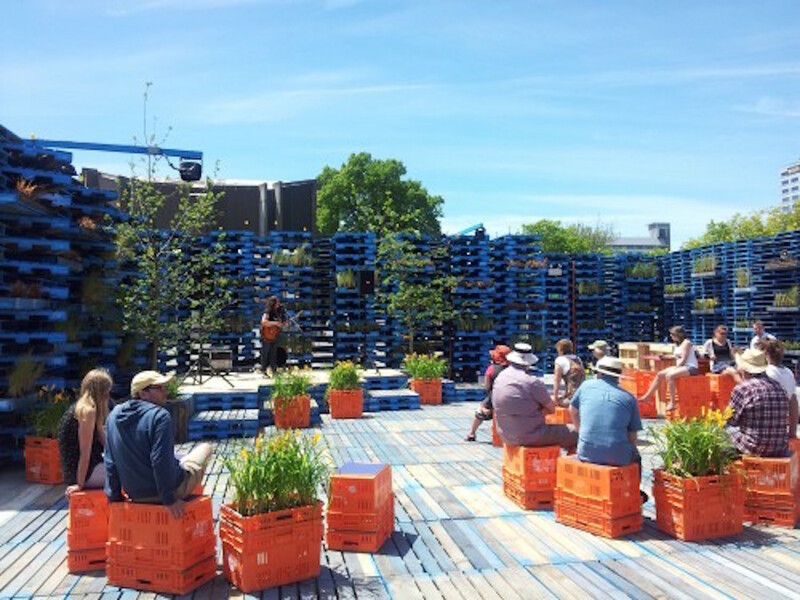 The Pallet Pavilion sat alongside other interesting projects to create a temporary events square for Christchurch and reinstate public access from Victoria Street to Victoria Square. The now-visible axis between the two is framed by tall arcade structures initiated by Life in Vacant Spaces and the Festival of Transitional Architecture. The Arcades Project will host regular markets and other outdoor events. In addition, CPIT architectural studies students have built a public earthen pizza oven. With the support of the Christchurch City Council the area will be brought back to life with a range of activities all summer long. Remarkably, Gap Filler has achieved a project of this scale with a tiny budget and the dedication of only two full-time staff. This is possible only because more than 250 volunteers and 50+ businesses partnered up and offered their time, energy, expertise and enthusiasm. Around 2600 volunteer hours went into this project!!! 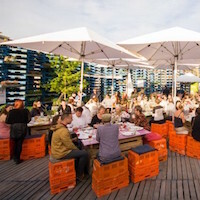 The Pallet Pavilion was proof that with a shared vision and common goal amazing things are possible! The restrictions of time, budget and resources forced creative solutions, experimentation, and community involvement. ‘Business as usual’ was not an option and we think that was a good thing. Most of the salvaged and borrowed materials used in the construction are being returned and put to future uses after the Pavilion is deconstructed. The pallets are being returned to CHEP and put back into circulation. The Pavilion’s temporary foundation is made up of floor slabs from the demolition of the nearby Clarendon Hotel. The slabs are going off to become bridges/ culverts over streams for Canterbury farmers. The furnishings were made from CHEP’s plastic crates, and they are being returned and put back into circulation. While everyone who came to make this project possible deserves acknowledgment there are a few key figures that deserve a standing ovation and sincere applause for their commitment and contribution. Trent Hiles and Coralie Winn from Gap Filler managed the team, materials and how to actually build the thing! This was done alongside Jason Mill (Pivnice and ZNO) who was responsible for the consent process and overseeing the design through construction. Andrew Just (F3 Design) also provided support through the design and consent process. The pavilion design was lead by Camia Young along with Sean Belling and Jordon Saunders of Studio Okan. They worked in close collaboration with recent landscape architecture graduate Kirsten O’Connor (Outlandish Landscapes), who was mentored by landscape architect Matt Lester (Earthwork). The magician on the team was the lighting designer, Kevin Cawley (Lighting Design). Aurecon was integral to the design team from the very early days, sponsoring engineering services from Luis Castillo, Mark Willard, David Elliot and Ros So-Beer (structure) and Paul Martini (fire). The lighting engineer was Andrew Johnston (Enlightenz). Dan Freeman from Higgs Construction and Trent Hiles from Gap Filler took the drawings and a flurry of volunteers and ostensibly effortlessly managed the building process and the materials. Big kids Meccano is how we like to think of it! Sally Airey, Sharon Moreham, Simon Guernsey and Jessica Smale coordinated the influx of volunteers, who collectively offered more than 2500 hours of labour! INCREDIBLE!!! In true Gap Filler fashion we designed and built this project through collaboration and community support. OK, so WHY on earth would a tiny little organisation like Gap Filler do something that is clearly much too big for them? A mixture of optimism, naivety and bloody-mindedness is the answer. 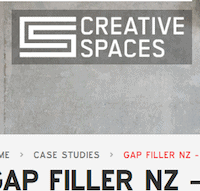 Gap Filler has been interested in temporary architecture since the early days. There is a real lack of diversity in Christchurch at present when it comes to temporary architecture. We’ve got shipping containers, porta-coms, marquees and geo-domes, but that’s about it. We’d like to see some more creative temporary architectural responses. There’s the Transitional Cathedral and ArtBox is not far from being brought out en mass in the city as part of the BoxedQuarter project, which is good to see. After that, I’m sure we’ll see more ArtBoxes around the place. So, we thought we’d put our money where our mouth is and DO something ourselves. 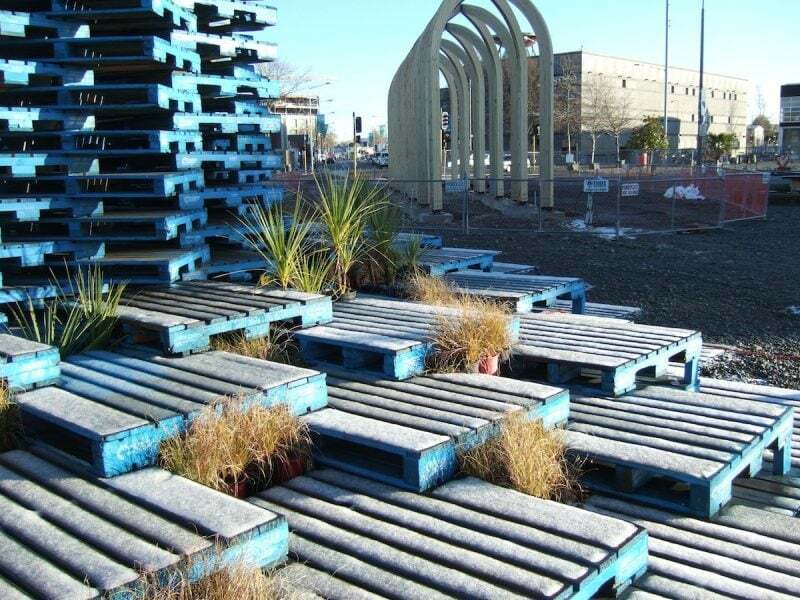 Pallets were chosen because they are readily available and often overlooked or discarded/burnt. They’re modular and strong. And they’re are beautiful en masse. We’ve been inspired by other pallet architecture and design projects from around the world. Check out this amazing pallet pavilion by Matthias Loebermann in 2005 (Germany). We think its beyoootiful. As part of the build, the world’s first endurance drilling championships were held with the 24 Hour Drillathon across November 2nd and 3rd, where volunteers drilled 2 holes in 2000 (ish) pallets from 12pm Friday 2 November until 12pm Saturday 3 November. A little rain interrupted things on Saturday morning, but other than that it was a grand success. And a very strange event! Adventurers, rebuilders, visionaries, action heroes and all-round enthusiasts were needed who were able and prepared to wield a power drill with a 16mm bit and drill through pallets for a time. Teams of two worked together to locate a jig on an undrilled pallet (the jig ensured the hole was drilled straight); the holes were drilled and the pallet was removed and added to the growing stack; the next pallet collected and placed, jigged, drilled, removed and on it went, for all the pallets. In return Gap Filler offered a once-in-a-lifetime experience, setting a possible world record, the chance to meet other interesting people, free food and the opportunity to work at 2.47am, drilling and stacking pallets. Mad? You bet! 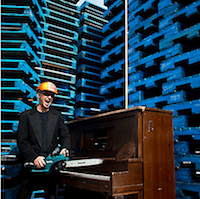 Gap Filler’s Pallet Pavilion project is one of seven finalists in the 2015 International Award for Public Art. An awards ceremony was held in June 2015 in Auckland and the winner announced. All the usual stuff that you see on Facebook. Such a lovely day-by-day history. 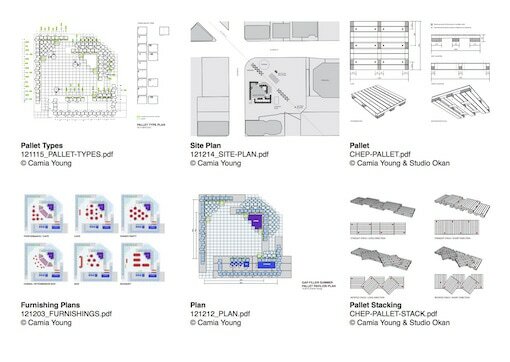 Stuff says ‘Gap Filler plans a low amphitheatre where the Pallet Pavilion used to stand in central Christchurch and is now consulting the public about the idea’. Thanks to Christchurch Casino for this video taken from their camera on the top of their building. Here’s a snippet of the wonderful Delany Davidson playing on our opening night!